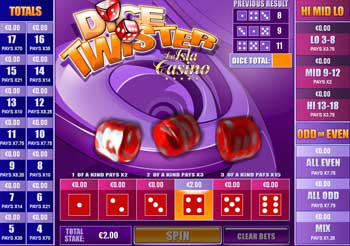 The object of Dice Twister is to place various bets on what the outcome of a three dice roll will be. Move your mouse over a corresponding bet area and click on the arrows to increase or decrease your bet amount. The amount you have bet on any bet area, is shown on the top of that bet area. Your total stake (sum of all bets for the next round) is displayed on the lower edge of the screen. Each of the bets has a different payout, written on the corresponding bet area. Totals - you bet that the total of the three dice on the next roll will be a certain number. You can place a total bet on sums 4 - 17. Numbers - choose one number from 1 to 6. You win according to the number of dice that show that number after the next roll. If no die shows that number, you lose your bet. Odd, Even, Mix - bet that all dice will show either an even number, odd number, or are mixed (show both even and odd numbers). When finished placing bets, click Spin . After the dice have stopped, your bets will be settled. You can then click Rebet to place the same bets again.